The property's host of recreational offerings ensures you have plenty to do during your stay. 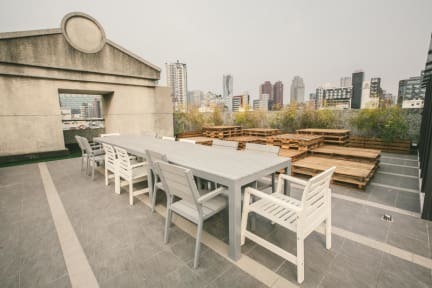 Superb facilities and an excellent location make Stray Birds Taichung Hostel the perfect base from which to enjoy your stay in Taichung. Stray Birds Taichung Hostel offers impeccable service and all the essential amenities to invigorate the weary traveler. This property offers numerous on-site facilities to satisfy even the most discerning guest. 2. Check in from 15:00 to 00:00. This is my second time try to stay in hostel, totally great. 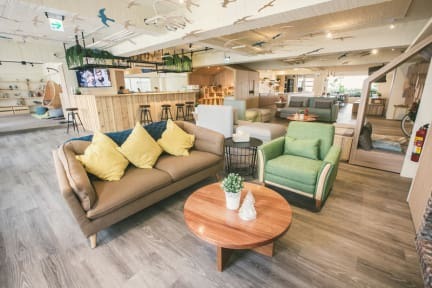 Good location, everything clean, very comfortable, nice staff, especially Alan, when I went back on night time, he invite me to join them for a drink, this is so warm. If next time in Taichung again, will choose stray birds. Recommended. Overall, the best stay we've had in our Taiwan trip. We love how Shelly accommodated us, and the baths! They're absolutely the best. I love how clean and chic it is and will absolutely come back when I get the chance. Much love from the Phils! This hostel probably represents the best choice in downtown Taipei. The dorm are well separated, the showers are nicely organized and the common rooms are large and well designed. Truly a must in Taiwan. This newly renovated hostel could house probably 100 people across few floors, with one floor as big beautiful "cowork" area. Thanks so much the staff, the design & production crew behind the scene, it is modern, with lovely atmosphere. By chance, local families stayed there on same days, as their home being renovated, the father who runs food business, brought us a BBQ at rooftop, what a surprise by chance. Hard to meet people, lots of outside noise on gongyi road side, but great hostel and staff. Extremely cute hostel and vibe! The staff were friendly, atmosphere was good and rooms and bathrooms were immaculate. I wish every hostel was this stylish. I was only here for one night but I hope that I can come back some day. awesome place to stay. very clean and comfy beds. definitely recommend this place! Absolutely stunning place , the public area is really nice . Pros: Many. Staff cares. Very new, clean. Box style beds have full curtains and feel private Cons: Few. Kind of cheap to charge for eggs/ coffee. No real information about sights. Only two toilets way down the hall is an issue in the am. The nice puffy comforter is only half size (!?) if you are big you will be uncovered. Really nice hostel in Taichung, easy to reach by bus from the main train and bus station. The vibes are good, the staff really helpful. The only thing which I did not like is that the bed duvet are quite tiny.